If you’ve had regular access to Maine Beer Co.’s IPAs, then you’re more than aware that the folks at MBC know their way around hop-forward beer styles. Deeper examination puts them in an interesting valley between categories, though. Take flagship IPAs such as Lunch and Another One—what substyle would you use to categorize those beers? In recent years, they’ve sort of been lumped into the still-emerging NE-IPA, but Maine has been producing beers in this style for longer than “NE-IPA” has been a recognizable term, and their house style predates the type of IPA being produced by the likes of Tree House or Trillium in Massachusetts. Even looking at their beers, it’s clear you’re not dealing with exactly the same sort of thing—they’re not nearly as opaque or creamy of body. Instead, Maine Beer Co.’s true area of specialty, at least in our mind, is a hybrid sort of IPA that combines some of the legacy of West Coast IPA with the focus on citrus/tropical fruit/juicy hop flavors that was emerging in the early 2010s when their brand got rolling. It’s a style that evokes some similarities to the hyped NE-IPAs of today, often using wheat or oats to produce a smooth, pillowy mouthfeel, but avoids the “double dry hopped” special release madness we’ve come to expect from breweries like Trillium or The Veil. MBC’s middle ground involves IPAs with plenty of juice, but significantly less fuss. 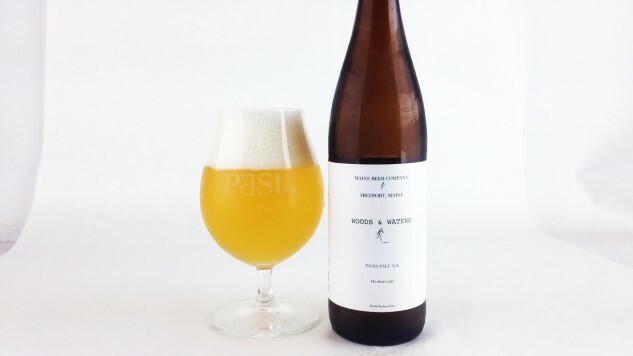 Case in point: The brewery’s new Woods & Waters IPA, a small-batch release brewed “to commemorate the establishment of the Katahdin Woods & Waters National Monument.” The brewery says they made use of Maine-grown barley and wheat, along with “generous amounts of American hops with flavors and aromas of citrus and pine” to produce this new, brilliantly yellow India pale ale. So let’s get to it. On the nose, Woods & Waters delivers clean, zesty citrus notes of lemon and orange, along with some fresh cut grass, all of which I was expecting. The bonus is a very nice undercurrent of stone fruit juiciness, a peach or apricot note that is lovely and inviting. On the palate, this proves to be a very light bodied, crisp, slightly thin IPA for its 6.2% ABV. There’s some minimal malt presence of light grain/biscuity malt, but balance is far in favor of lemon citrus and peachy hops, with touches of grass/resin, and just a ghost of residual sweetness to amplify the juiciness—still errs on the dry side, though. As a result, it drinks extremely easily; an amazing IPA for the heat of summer. Bitterness is minimal, but not totally absent. Jim Vorel is a Paste staff writer and resident beer guru. You can follow him on Twitter for much more beer content.